New York City nuclear freeze march, June 12, 1982. From Acc. no. 11-1117, Presbyterian Peacemaking Program photographs, 1982-2003. The freeze movement was in some ways a reversion to positions long held by Presbyterians. Beginning with the General Assembly of 1946, the Presbyterian Church in the U.S.A. called for nuclear disarmament, both bilaterally through international agreement, and unilaterally. The 1946 Assembly called for "the immediate cessation of the manufacture of atomic bombs" and for "drastic cuts in national armaments through international agreements." Throughout the 1950s, PCUSA General Assemblies endorsed the work of international negotiators. The 1955 General Assembly denounced the much-mooted use of so-called tactical nuclear weapons, saying, "The ensuing destruction would be an atrocity before God and would justly arouse the horror of the world and the moral indignation of mankind." Throughout the 1950s and 1960s, northern and southern Presbyterians called for a comprehensive test ban treaty, an anti-ballistic missile treaty, and multilateral disarmament. "The ensuing destruction would be an atrocity before God and would justly arouse the horror of the world and the moral indignation of mankind." Beginning in the 1960s, anti-nuclear activists came to endorse the position of the American Friends Service Committee, which had since Hiroshima argued for immediate, unilateral nuclear disarmament. Nuclear war was regarded as categorically distinct from conventional warfare, as it carried the capacity for complete annihilation of human life on Earth. The moral obligation not to use nuclear weapons extended to the practice of stockpiling them: the nuclear arsenals of the United States and the Soviet Union stoked suspicion and fear, which created a climate of continuous provocation to violence. 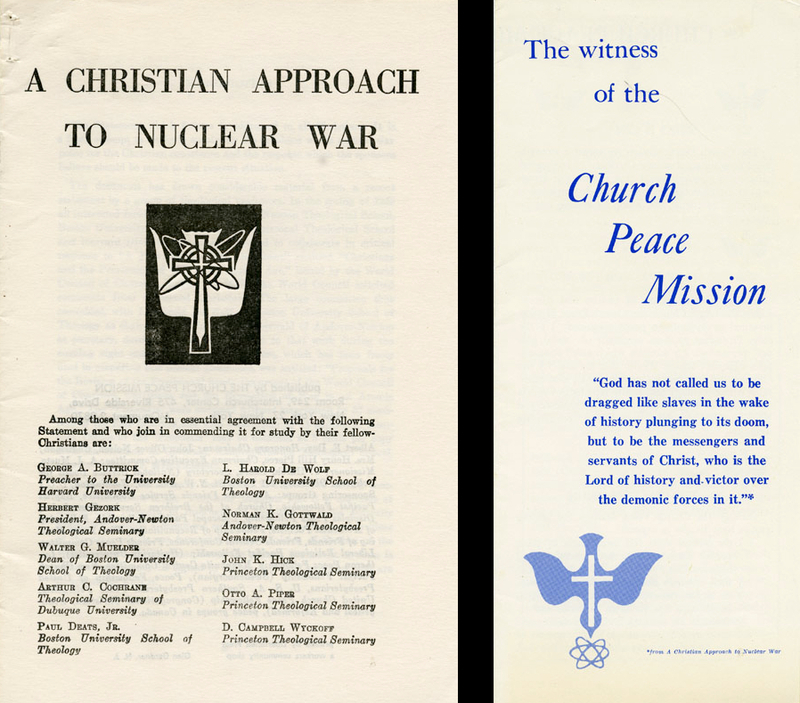 Church Peace Mission, A Christian Approach to Nuclear War, 1962, and The Witness of the Church Peace Mission, 1964. From RG 78, United Presbyterian Church in the U. S. A. Board of Christian Education. Council on Church and Society records, 1948-1968, box 11, folders 10-11. During this time, the Southern Presbyterian Peace Fellowship and the Peace Fellowship of the UPCUSA jointly sponsored the Church Peace Mission, housed in the Interchurch Center at 475 Riverside Drive in New York City, which called for immediate American withdrawal from the arms race. George Buttrick of Madison Avenue Presbyterian Church in New York City, a veteran of the modernist-fundamentalist controversy then approaching seventy years of age, was among its chief organizers. With broad ecumenical support, including from such luminaries as Martin Luther King, Jr., unilateral nuclear disarmament became a default position for peace activists. The UPCUSA Confession of 1967 made unilateral disarmament theologically explicit, explaining that peacemaking "requires fresh and responsible relations across lines of conflict, even at risk to national security." Following the Strategic Arms Limitation Talks pursued by Presidents Nixon, Ford, and Carter, the notion of unilateral disarmament appeared out of touch with diplomatic reality. In late 1979, following the Soviet invasion of Afghanistan and the U.S. Senate's rejection of the SALT II treaty, activists swiftly shifted to promotion of a verifiable bilateral freeze on development of new nuclear weapons, promoting a document, Call to Halt the Nuclear Arms Race, through local referenda. With the election of Ronald Reagan, a longtime critic of détente, the freeze movement gained urgency. In 1981, the 193rd General Assembly of the UPCUSA endorsed the Call. 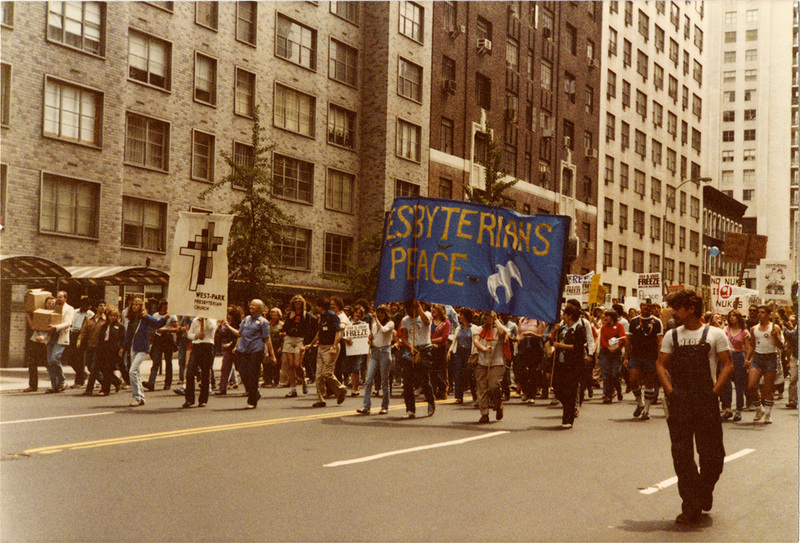 By 1982, nuclear freeze organizers, counting among them the Presbyterian Peace Fellowship, could mobilize over one million people for a march through New York City. In the 1980s the UPCUSA Advisory Council on Church and Society and Mission Responsibility Through Investment continued to advocate for nuclear disarmament. The 194th General Assembly in 1982 called for divestment from General Electric and Boeing on the grounds that the corporations perpetuated the nuclear arms race. In 1983, MRTI produced a study guide, The Price of Peacemaking, for congregations whose sessions had signed on to the nuclear freeze. ACCS in 1985 published Presbyterians and Peacemaking : Are We Now Called to Resistance?, which treated resistance as a "stance of faith" embodied in Biblical and historical precedents. Opponents of the freeze latched on to the language of resistance, identifying members of the peace movement as communist fellow-travelers. The November/December 1985 issue of the Presbyterian Layman included the headline "Consorting with the Foe: the Peace Movement." Responding to Resistance, the Nashville-based Presbyterians for Democracy and Religious Freedom was formed in 1986. PDRF published its counterargument in Peacemaking? Or Resistance? : Presbyterian Perspectives, offering a Christian case for nuclear deterrence, and identifying in the ACCS's use of the word "resistance" a call to Presbyterians to refuse to pay taxes. The volume closed with a letter to stated clerk Jim Andrews signed by nine active or retired military officers and a former Assistant Secretary of State, demanding the PC(USA) "halt further steps on the part of its agencies to establish any policy of 'war tax resistance.'" Overtures to the 1987 General Assembly to withdraw Resistance were rejected, and its language, along with that of its opponents, shaped the 1988 General Assembly policy document Christian Obedience in a Nuclear Age . With the collapse of the Soviet Union, the ratification of the START I and II treaties, the mothballing of the Strategic Defense Initiative, and other developments, the nuclear freeze, a position of compromise for peace activists called an act of treason by staunch anti-communists, waned. On September 21, Presbyterians are called to commemorate the International Day of Peace , and they continue to witness to and work for peace and justice.